We’ve made it the top ten schools ranked by current NFL Talent! We hope you enjoyed the countdown and feel free to comment and disagreements to start a fun debate. The Pitt Panthers start up the top 10 of this list. Pitt may not be the winningest program but man do they produce NFL talent. They finish as the second ranked ACC school on this list. The top former Panther in the NFL right now is Bills Running Back LeSean Mccoy. Mccoy has proved to be one the top running backs in all of the NFL. In a career split between the Eagles and Bills Mccoy is a five time pro bowler, two time first team all pro running back, 2013 NFC offensive player of the year, the 2013 NFL rushing yard leader, and the 2011 rushing touchdown leader. Mccoy has had five 1,000 yard plus rushing yard seasons his single season career high being 1,607 in 2013. Honorable mentions go to Ram’s Nose Tackle Aaron Donald, Patriot running back Dion Lewis, Cardinals Larry Fitzgerald, and Jets Corner Darrelle Revis. Donald had made it to the pro bowl in each of his first three seasons in the NFL. He also is already a two time first team all pro honor, and was named the defensive rookie of the year in 2014. Dion Lewis has become a pivotal piece in the New England offense over the past two seasons as he has shared time with Legarrette Blount as the featured back. In the 2016 divisional playoffs he took back a 98 yard kick to the house to help lift the Patriots over the Texans. If this list was made two seasons ago Larry Fitzgerald and Darrelle Revis may split the honor. Now with both in decline they are just honorable mentions but they will both be enshrined in Canton one day and make fans back at Pittsburgh proud. Fitzgerald is a ten time pro bowler, two time first team all pro, and two time NFL receiving Touchdown leader. Fitzgerald is probably the best player ever to put on an Arizona Cardinal uniform. In a career split between the Jets, Bucs and Patriots Darrelle Revis is a seven time pro bowler, four time first team all pro honor, was named the 2009 AFC defensive player of the year, and helped the Patriots win Super Bowl 49 as the team’s top corner. At one point Revis was the NFL’s best cornerback. Georgia is another school loaded with NFL talent. They finish as the fourth ranked SEC school on this list. The top former Bulldog is Lion Quarterback Matthew Stafford. Stafford is a former pro bowler, and was named the 2011 NFL comeback player of the year. Though he may not have any big accolades he has a quite a resume. The former first overall pick has led the Lions to the playoffs three times after being drafted in 2009 the year after the Lions went 0-16. In 2011 Stafford’s Lions made the playoffs for the first time since 1999. Stafford threw for over 5,000 yards that season. Stafford arguably had his best year in 2016. In a playoff season for the Lions Stafford threw for 4,327 yards, and 24 touchdowns. Honorable mentions go to Bengal Wide Receiver A.J. Green, Bengal Nose Tackle Geno Atkins, and Panthers linebacker Thomas Davis. A.J. Green is one of the top play makers in the NFL. Green is a six time pro bowler, a two time first team all pro Wide Receiver and has helped lead the Bengals to the playoffs in five out of six of his first seasons in the NFL. Geno Atkins is a five time pro bowler and like Green is a two time first team all pro honor. Atkins has had three nine plus sack seasons for the Bengals. Thomas Davis is a two time pro bowler and was named first team all pro in 2015. Davis has had at least 100 tackles in five straight seasons. What a loaded group we are about to discuss. USC has provided many of the NFL’s best players and there were so many not everyone could even get an honorable mention. USC is the top ranked Pac 12 school on this list. 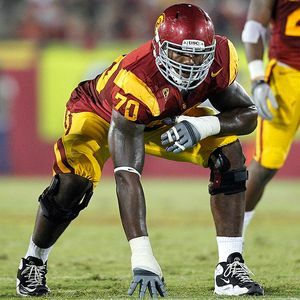 The top former Trojan in the NFL is Cowboys offensive tackle Tyron Smith. Smith one of the best offensive lineman in the game is a four time pro bowler, two time first team all pro honor, and two time second team all pro honor. Honorable mentions go to Cardinals Quarterback Carson Palmer, Texan Linebacker Brian Cushing, Vikings Offensive Tackle Matt Kalil, Raiders Linebacker Malcolm Smith, and Packers Linebacker Clay Matthews. Palmer a former Heisman winner is a three time pro bowler, second team all pro honor, was named NFL comeback player of the year in 2015, led the NFL in touchdown passes in 2005, and was named AFC Player of the year in 2005. Palmer has played for the Bengals, Raiders, and Cardinals and has made the playoffs with all teams but the Raiders. Brian Cushing is a former pro bowler, and a second team all pro honor. He was named defensive rookie of the year in 2009. Matt Kalil is a pro bowl offensive tackle standing 6 foot 7 he is one of the most feared offense lineman in the sport. Malcolm Smith put his name in the NFL history books by winning the Super Bowl MVP award for the Seahawks in Super Bowl 48. Smith had a monster game that day with two interceptions one of which he took back for a touchdown, a fumble recovery, nine total tackles, and two passes defend. Clay Matthews who has a Super Bowl 45 Super Bowl ring is a six time pro bowler, a first team all pro honor, two time second team all pro honor, and was named the 2010 NFC Defensive player of the year. Oklahoma is another school that has decorated the NFL with talent. Oklahoma is the the top ranked BIG 12 school on this list. The top former Sooner in the NFL is Redskins offensive tackle Trent Williams. Williams arguably the NFL’s top offensive tackle is a five time pro bowler, and a second team all pro honor. Honorable mentions go out to Giants Wide Receiver Sterling Shepard, Viking Quarterback Sam Bradford, Titans Running Back DeMarco Murray, and Bucs Nose Tackle Gerald Mccoy. Sheppard had an outstanding Rookie Year for the Giants in 2016. Sheppard has 683 receiving yards, and eight touchdown catches helping the Giants win 11 games making the postseason. Bradford a former heisman winner was named NFL offensive rookie of the year in 2010. Bradford who has played for the Rams, Eagles and Vikings put his name in the NFL record books in 2016 when he set the single season completion percentage record completing 71.6% of his classes. DeMarco Murray who has spent time with Dallas, Philadelphia, and Tennessee is a three time pro bowler, former first team all pro running back, and in 2014 won the NFL rushing title, NFL rushing touchdown title, and was named NFL offensive player of the year. Gerald Mccoy is the heart and sole of the Bucs defense. He is a five time pro bowler, three time first time all pro, and second team all pro honor. Florida State finishes just short of the top five but have plenty of NFL talent to still brag about. Florida State is the top ranked ACC school on this list. The top former Seminole in the NFL right now is Vikings Cornerback Xavier Rhodes. Rhodes in 2016 proved to be one of the NFL’s top corners. Rhodes who was named to his first pro bowl in 2016 shut down receivings like Kelvin Benjamin, Odell Beckham, and John Brown in 2016. He grabbed five picks one of which he took to the end zone, had 52 total tackles and forced a fumble. Honorable mentions go to Buccaneers Quarterback Jameis Winston, Falcons Running BAck Devonta Freeman, Bills Corner Ronald Darby, and Raiders Kicker Sebastian Janikowski. Winston a former Heisman winner and NFL top overall pick turned the Bucs from a two win team to a .500 team in just two seasons. He already has been named to a pro bowl, and was named NFL Rookie of the Year in 2015. Devonta Freeman has emerged as one of the NFL’s top Running Backs. Freeman is a two time pro bowler, second team all pro honor, and led the NFL in rushing touchdowns in 2015. Ronald Darby won the Pro Football Focus 2015 NFL defensive rookie of the year award. Darby has emerged as one of the NFL’s top corners with a pair of 68 plus total tackle seasons, and two years of at least 12 passes defend. Sebastian Janikowski who was once a Kicker taken in the first round of the Draft by the Raiders in 2000 is a pro bowl kicker, and former second team all pro honor. Janowski is the Raiders all time leading scorer. Texas A&M is another school who has produced a boatload of NFL talent. Texas A&M is the third ranked SEC school on this list. The top former Aggie in the NFL right now is Broncos pass rusher Von Miller. Miller is a five time pro bowler, three time first team all pro honor, two time second team all pro honor, and was named 2011 NFL Defensive rookie of the year. Miller helped the Broncos win Super Bowl 50 in a big way winning the MVP of the game. In his MVP performance Miller had 2.5 sacks and forced two fumbles. Miller was rewarded with the highest contract ever given to a defense player a deal worth up to 114 million dollars. Honorable mentions go to Seahawks Michael Bennett, Dolphins Ryan Tannehill, Patriots Tight End Martellus Bennett, and Buccaneers Wide Receiver Mike Evans. Bennett is a two time pro bowl defensive end and owns a Super Bowl 48 Super Bowl ring as he was a huge part of a top ranked Seattle defense. In 2015 Bennett had a career high 10 sacks. Ryan Tannehill was having a great 2016 after three up and down years until injury ended his season three weeks early. However Tannehill helped put the Dolphins in a position to ultimately clinch a playoff berth. The signal caller had a Quarterback rating of 93.5 the highest of his career in 2016. Martellus Bennett is a former pro bowler who is among the top Tight End’s in the NFL. In a career split between the Cowboys, Giants, Bears and Patriots Bennett has four 5 plus touchdown seasons and has gone over 700 yards revving three times. Mike Evans the first Wide Receiver taken in a 2014 draft that featured Odell Beckham JR made it to his first pro bowl in 2016 and was also named a second team all pro honor. Evans had 1,321 receiving yards hauling in 12 Touchdowns for the Buccaneers. Ohio State is just two years removed from winning a National Championship and in 2016 made it to the College Football playoff meaning they have a shot at soon being number one on this list due to the NFL talent set to be drafted this spring. Right now however they finish fourth and as the second ranked B1G ten school on the list. The top former Buckeye in the NFL right now is Cowboys Running Back Ezekiel Elliott. Elliot had maybe the best rookie season in NFL history in 2016. The rookie running back was not only elected to his first pro bowl he was named a first team all pro, and led the entire NFL in rushing with 1,631 rushing yards. He also ran in 15 Touchdowns. Honorable mentions go out to Browns Wide Receiver Terrell Pryor, Steelers Linebacker Ryan Shazier, Giants Nose Tackle Johnathan Hankins, and Jets Center Nick Mangold. Pryor made the switch from Quarterback to Wide Receiver in 2016 and emerged as a top flight Wide Receiver. Pryor was a lone bright spot on a woeful Browns team racking 1,007 receiving yards for four touchdowns. Ryan Shazier had 87 total tackles in 2016 with three forced fumbles and three picks proving to be a Linebacker who can do a little bit of everything. Johnathan Hankins emerged as a top flight run stopper for the Giants in 2016 making 43 total tackles, forcing a fumble, and getting three sacks. Jets Center Nick Mangold is a seven time pro bowler, two time first team all pro honor, a 2011 second team all pro honor, and was named first team all rookie in 2006. Wisconsin has been a program on the rise of late and the players they have sent to the NFL of late reflect beautifully on the program. Wisconsin is the top ranked B1G Ten school on this list. The top former Badger in the NFL right now is J.J. Watt of the Houston Texans. Though he missed most of 2016 due to injury Watt is still the top defensive player in the NFL. Watt just 27 has a Hall Of Fame resume. Watt is a four time pro bowler, four time first team all pro honor, two time NFL sack leader, and most impressively a three time NFL Defensive Player of the year award winner. Wat posted a pair of 19 sack seasons, and a total of four seasons where he recorded at least 12. Honorable mentions go to Browns Offensive Tackle Joe Thomas, Cowboys Center Travis Frederick, Seahawks Quarterback Russell Wilson, Chargers Running Back Melvin Gordon, and Giants Linebacker Jonathan Casillas. Like Watt Joe Thomas seems to be bound for Canton. The lifelong Brown is a 10 time pro bowler, eight time first team all pro honor, and 2008 second team all pro honor. Despite all the losing Thomas has not missed one game since his career began in 2007. Travis Frederick is a huge part of the Cowboys dominate Offense Line. Fredrick is is a three time pro bowler, two time second team all pro honor and was named first team all pro in 2016. Russell Wilson is in the conversation for being a top 10 NFL Quarterback. In his five years in the NFL Wilson has been to the playoffs five times and the Super Bowl Twice. Wilson led the Seahawks to their first Super Bowl title in franchise history in just his second season in the NFL back in 2013. Wilson is also a three time pro bowler, and 2015 NFL passing rating leader. Melvin Gordon a former first round pick ran for 997 yards in just 13 games in 2016. He also scored 10 touchdowns in 2016 the first 10 of his career. Jonathan Casillas broke out in 2016. After being a Special Team and role player on the Super Bowl 44 winning Saints, and Super Bowl 49 winning Patriots Callias was the defensive captain for the Giants in 2016. The captain had a career high 96 total tackles, forced a fumble, and got a sack from the outside linebacker spot. This was super close but LSU finished second on this list. LSU has produced a ton of NFL talent over the years and have been among the winngest programs of late. Though the Tigers finish second on this list they are still not the top ranked SEC team as they finish second in that department as well. The top LSU Tiger in the NFL right now is Giants star Wide Receiver Odell Beckham JR. Since his first NFL game in 2014 where he scored a Touchdown Beckham has been one of the game’s most consistent receivers. Beckham’s 2014 rookie year is up there among the best rookie seasons in NFL history. He played just 12 games due to an injury but he still made 91 catches, racked in 1,305 receiving yards and caught 12 Touchdowns. He was named NFL offensive rookie of the year. Since then Beckham has stayed outstanding. He has had at least 1,3600 receiving yards the past two seasons catching at least 10 touchdowns in all three years of his career. He also had an 101 catch season in 2016. Overall Beckham is a three time pro bowler ,and two time second team all pro honor. Honorable mentions go to Cardinals Cornerback Patrick Peterson, Cardinals Safety Tyrann Mathieu, Dolphins Wide Receiver Jarvis Landry, Bengals Running Back Jeremy Hill, and Bucs Linebacker Kwon Alexander. Peterson has made it to the pro bowl in all six of his NFL seasons, and is a three time first team all pro honor. Peterson is also a stellar return man on special teams. He has four career punt return touchdowns. Tyrann Mathieu is a 2015 Pro Bowler, and was named first team all pro that year. Jarvis Landry best friend of Odell Beckham JR is a pretty good Wide Receiver himself. The Dolphin reviewer is a two time Pro Bowler and had at least 1,100 receiving yards the last two seasons. Jeremy Hill led the NFL in rushing touchdowns in 2015 with 11. He has ran for at least nine touchdowns in each of his first three NFL seasons all with Cincinnati. Kwon Alexander made 145 total tackles for the Bucs in 2016 also adding a forced fumble, interception, and three sacks. And the number one ranked school is……. Alabama. Shocker right? Okay not really… Anytime one talks about College Football Alabama is the first program to come to mind. Alabama has won four national championships over the last six seasons, and made it to the College Football playoff all three years of its existence going in as the number one team twice. After a season that saw Alabama put together a perfect regular season but fall short of a National Title this list of Alabama players in the NFL will get deeper but even without the new faces coming Bama has the best group of alumni playing in the NFL. The top former Crimson Tide player in the NFL is Falcons Wide Receiver Julio Jones. Arguably the NFL’s best Receiver Jones has quite the resume. He is a four time pro bowler, two time first team all pro honor, and led the NFL in receiving yards in 2015. Honorable mentions go to Giants Safety Landon Collins, Raider Wide Receiver Amari Cooper, Ravens Linebacker C.J. Mosley, Packers Corner Ha Ha Clinton Dix, Titans Running Back Derrick Henry and Saints Running Back Mark Ingram. After a rough rookie year in 2015 Collins emerged as one of the NFL’s top defensive players in 2016. Collins was named a first team all pro honor, and was elected to the pro bowl in a season where he had 125 total tackles, five interceptions one of which was taken back for a touchdown, a fumble recovery, and four sacks from the Safety position. Amari Cooper has been elected to the pro bowl in each of his first two NFL seasons and helped the Raiders make the playoffs for the first time since 2002 in 2016. C.J. Mosley has had at least 90 total tackles in each of his first three NFL seasons. He is a two time pro bowler, and two time second team all pro honor. Marcell Davis. Ha Ha Clinton Dix made his first pro bowl in 2016, and was named second team all pro. Dix had 80 total tackles, and five interceptions for the Packers in 2016. 2015 Heisman Trophy Winner Derrick Henry had an outstanding rookie year for the Titans in 2016. Henry who along with Demarco Murray was a member of one of the best backfield duos in the NFL ran for five touchdowns in rookie season. 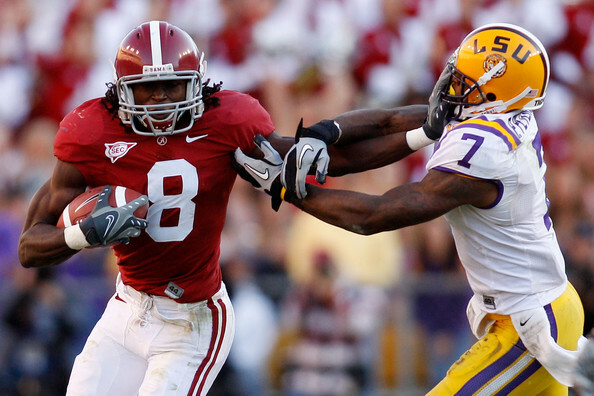 Mark Ingram who also won a Heisman Trophy while at Bama is a former Pro Bowler who is among one of the NFL’s most consistent backs. Posted in Alabama Crimson Tide, Florida State Seminoles, Georgia Bulldogs, LSU Tigers, NCAAF, NFL, Ohio State Buckeyes, Oklahoma Sooners, Pittsburgh Panthers, USC Trojans, Wisconsin Badgers and tagged NCAAF, NFL, Power Fives.